Bees are among the most important creatures for humans on Earth. These amazing insects pollinate over 80% of all flowering plants, including 70 of the top 100 human food crops. One in three bites of food that we eat is derived from plants pollinated by bees. All sorts of fruit and vegetables are pollinated by honey bees, such as broccoli, squash, apples, and almonds. Pollination is not only important for the food we eat directly, but it is vital for the foraging crops, such as field beans and clover, used to feed the livestock and wildlife which many depend on for meat. I began by setting up a swarm trap box (10 frames deep), and then I transferred them into a new box with a feeder and set it back up in the same location. When moving bees, the general rule is to move them 3 feet or 3 miles or shut them in for a couple days. The night before is a good time to get the hives ready. Before dawn on the day of the move also works. If the hive is closed up during the day, any foragers out in the field will be left behind. Close up the hive with a screen over any entrance/exit point. Good ventilation is crucial, especially if it’s hot outside. When releasing the bees I recommend placing a leafy branch in front of the box entrance. This will cause them to reorient themselves because the view from the hive is unfamiliar. 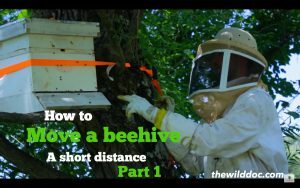 I look forward to harvesting some honey this year and hope you find this video and information helpful on your beehive transfer venture.